The Great British Bake Off is bake on British TV and, like thousands of others, it has reinvigorated my interest in baking! My sister and her colleagues have decided to each choose a week to bake some goodies and take them along to the office to share. The idea is that they bake something that was on the programme that episode. However I’ve made it easier on myself and just stuck to the theme. The idea is to challenge myself to bake a new recipe or come up with a new idea. This week was biscuit week (week 2)! There was lots of shortbread being made, so this inspired my first attempt at these ‘Salted Butterscotch and Almond Shortbread Biscuits’. You may be wondering why I’m starting with week 2, and what happened to week 1! Well I’ve started late so I’m kind of cheating and counting a previous bake (from 4 months ago!) as my week 1 contribution: Black Forest Cake. I’m also on Twitter @wangsamsin so feel free to follow my progress! In a small pan, bring cream to the boil and stir in butter. Turn down the heat to low then the sugar, stirring until the butterscotch becomes smooth. Left-overs can be stored in a sterilised jar in the fridge for up to a month. Use as a sauce for ice cream or pancakes! Heat the oven to 190C/375F/Gas 5. 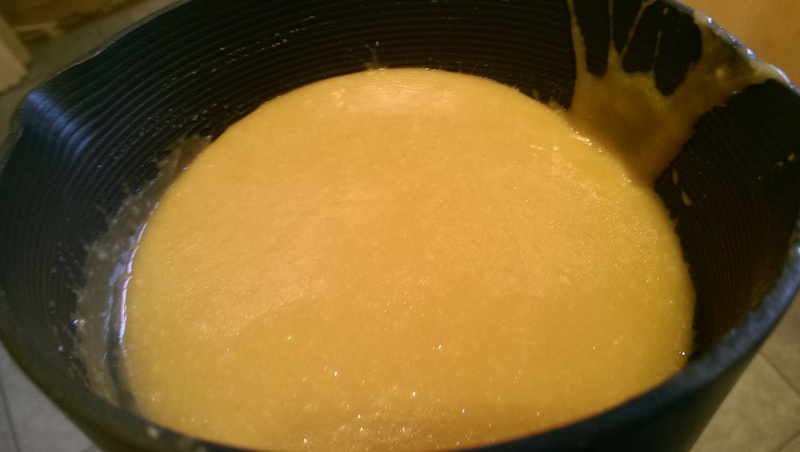 Beat the butter and the sugar together until smooth with an electric mixer. Stir in the flour and almond to get a smooth paste. Turn on to a work surface and gently roll out until the paste is 1/2 cm thick. 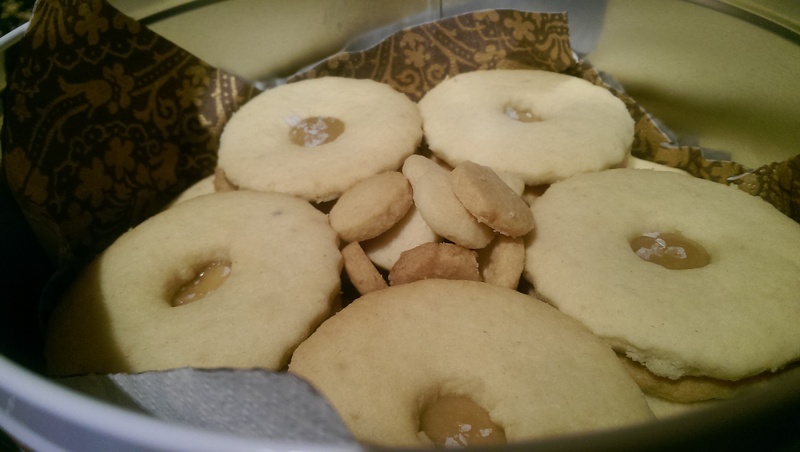 For the second batch, I cut a small hole in the centre of each biscuit to allow the butterscotch filling to show through. Cut into shapes, place onto a baking tray. Bake in the oven for 10-15 minutes, or until pale golden-brown. Set aside to cool on a wire rack. 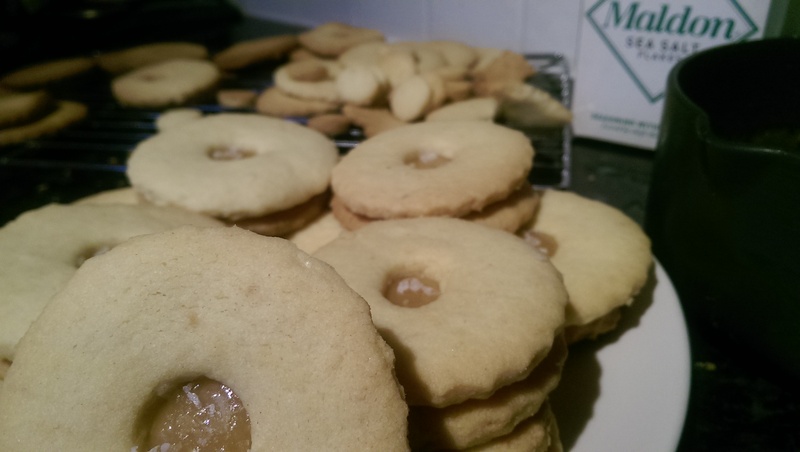 Make sure you bake the ‘holes’ too as they make really cute mini-shortbreads! Think of a ‘Jammy Dodger’ and you’ll not go wrong! Using the plain biscuit as the bottom layer, spread a layer of butterscotch filling on it then ‘sandwich’ it with a top layer that has a hole in it. Simple! Believe it or not these cookies started as ‘oatmeal biscuits’! I’ve not been very organised in the kitchen recently, starting to bake or cook a recipe and then realising half way through that I don’t have all the ingredients I need! So upon realising I had no golden syrup required for the recipe, I found some maple syrup and agave syrup so bunged that into the mixing bowl instead. So that’s a fairly non-recipe destroying substitute right? Oh, but there is more… I then went to grab the bag of oats and found there was none! How unprepared can a cook be?! 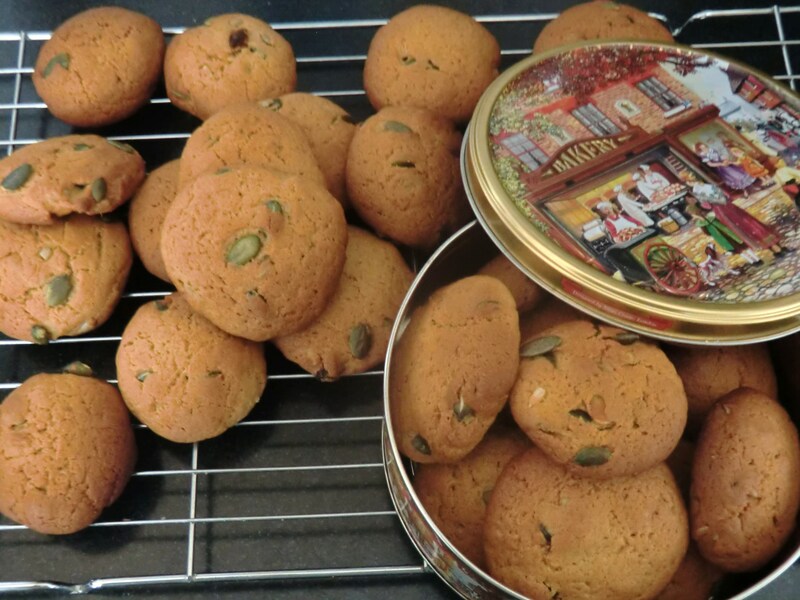 Being unwilling to go out to the shops to buy the oats (it was rainy and miserable outside) I decided to press on ahead and make the biscuits using only self raising flour, but throwing in some mixed seeds and pumpkin seeds that I found in the baking cupboard. 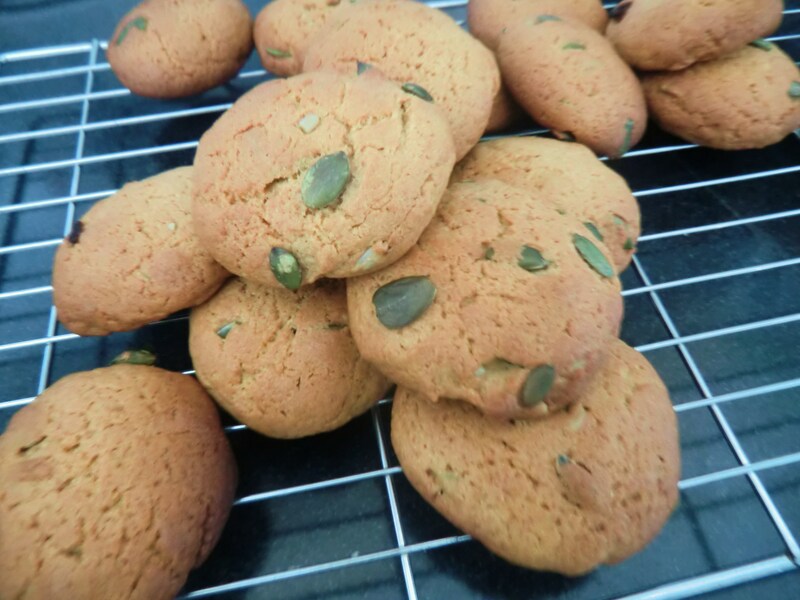 After 15 minutes in a hot oven, I ended up with Maple Syrup and Pumpkin Seed Cookies! Ta Da! Like magic I have created a new recipe by accident and they tasted pretty good too… I’ve called them cookies as they were chewy inside but crisp on the outside. The different syrups helped to create a lovely rich caramel flavour and the seeds added a nutty taste and extra bite to each mouthful. I won’t post the recipe since I was making it up as I went along, so don’t actually know quantities of the ingredients I used!